BLOG FEATURE. 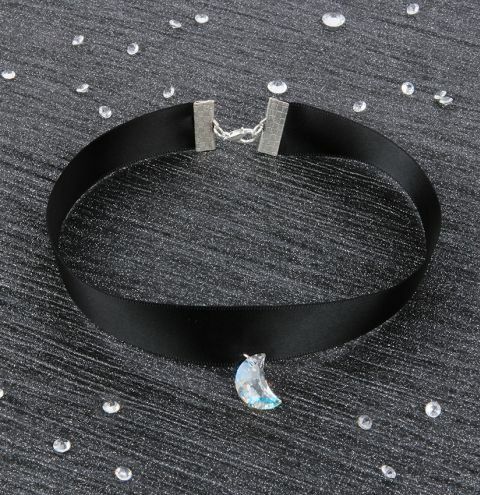 Make yourself a trending choker for upcoming party celebrations! Read the full blog post HERE. Measure the width of your neck using a piece of ribbon or measuring tape. Subtract half an inch from the overall length and cut the ribbon. Fold over the end of ribbon, doubling the thickness. This will give the ribbon end more to grip onto and prevent fraying. Attach the ribbon ends by clamping them down in place with your pliers. Connect a jumpring to both of the ribbon ends, and add a lobster clasp to one side. Using a bead reamer or needle, make a small hole in the centre point of your ribbon approx 4mm away from the edge. Open a jumpring and attach the Swarovski moon crystal to the ribbon through the hole you just made.